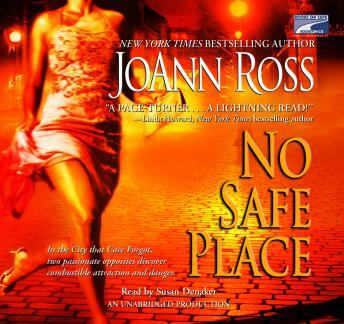 A stunning new novel of chilling suspense and explosive chemistry from New York Times bestselling author JoAnn Ross. Chicago homicide detective Kate Delaney fiercely defends victims. Which is why–despite death threats–she’s testifying to a federal grand jury about local police corruption. It’s also why she’s infuriated by the New Orleans police department’s blasé attitude toward her estranged sister’s death. But pursuing an investigation in a strange city means allying with someone who knows the territory. And the players. Someone with a total disregard for the rules. As an ex-cop from a police family, New Orleans PI Nick Broussard knows that cops live by their own code. You don’t rat out a fellow officer. The last thing he needs is some smart-mouthed, by-the-book outsider unknowingly injecting herself into his undercover search for the truth. Even worse is the way she conjures up visions of tangled sheets. . . .
Nick and Kate’s chase pits them against the criminal underworld of the sultry southern city. And as they peel away layers of deadly deception, they discover a dark secret too many are willing to kill to keep.